Microsoft recently added a training kit for Business Activity Monitoring. I downloaded the kit and installed it on my BizTalk 2006 R2. 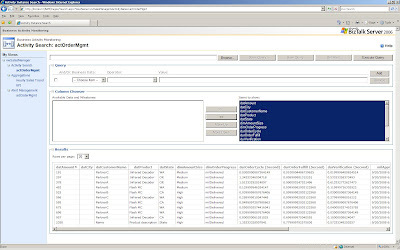 This kit kit contains an overview of the BAM feature ("BAM Training.doc"), a BAM solution sample ("BAM Training_Hands-On Exercises.doc"), sample code files to use with the sample solution ("BAM Training_Lab Files" folder), and a PowerPoint slide deck to use in an instructor-led setting ("BAM Training_Instructor Slide Deck.ppt"). Before running the kit I checked if BAM was properly configured in this environment, which was not the case. After I configured BAM I ran the executable, which contains a sample called ‘OrderProcess’ solution and msi. I imported this msi file inside BizTalk Administration console. 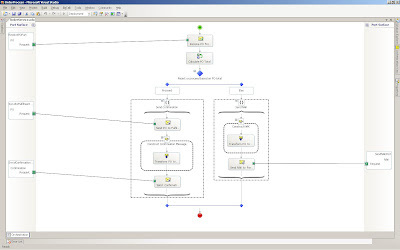 The solution contains one orchestration visualized below. Command line tool found in the same directory as bm command line tool. Finally I tested to complete scenario, where I had to check if all ports were going to the correct file locations. I then stared the application inside BizTalk and copied PO xml file’s in folder, which was configured as receive location (Receive Port). I then looked at BAM Portal and a view vwSalesmanager was present, so tried a couple of things. If you are familiar with BAM than most of this make sense and you will probably have some or a lot of experience with BAM. Those of you who are new to BAM or want to get to know it better, this training kit is very useful.